TheGLXD16 Guitar Pedal Wireless System. Includes GLXD6 guitar pedal receiver, GLXD1 bodypack transmitter, guitar cable, rechargeable battery, power supply, wall battery charger, and user guide. GLXD6 provides easy mounting on / powering from pedal boards. A built-in chromatic instrument tuner has both strobe and needle tuning views. The foot switch enables shifting between wireless display and tuner mode with the option to mute or pass the audio signal while tuning. For use with GLX-D® Digital Wireless Systems. GLXD1 features an ergonomic design and reversible belt clip to fit comfortably and snugly in various positions. For use with GLX-D® Digital Wireless Systems and GLX-D® Advanced Digital Wireless Systems with firmware update 2.2.5 or later. GLXD1 offers up to 16 hours of continuous use with Shure lithium-ion rechargeable batteries. Premium 1/4"-to-TA4F guitar cable with locking thread connects the bodypack transmitter to a guitar or bass. 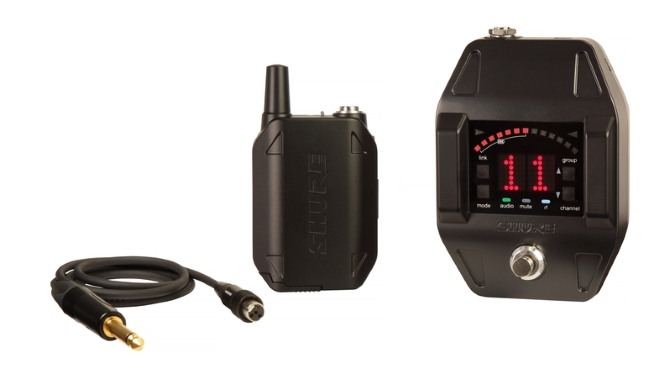 For use with GLX-D® Digital, ULX-D®, and QLX-D™ Digital Wireless Systems.